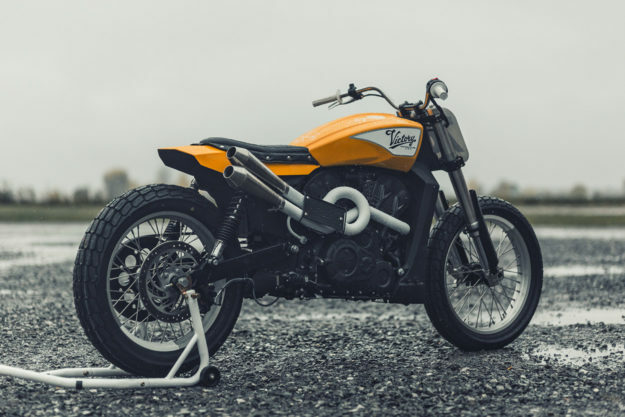 There’s a lot of truth in the phrase “You make your own luck.” And that’s the subtext of the story behind this striking-looking Victory Octane, built by Samuel Guertin of Montréal-based Clockwork Motorcycles. Guertin’s star is on the rise, thanks to a stream of quality builds that capture the zeitgeist of the current custom scene. 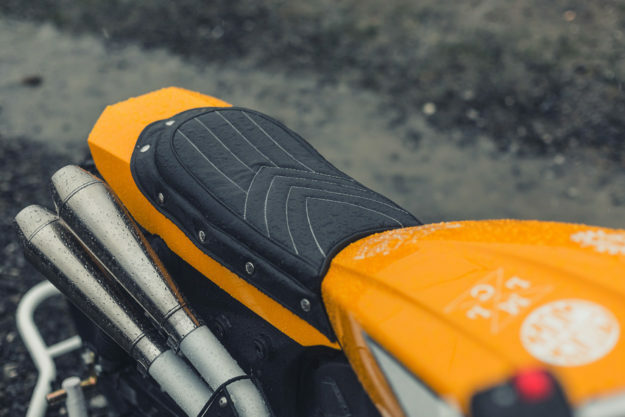 And then he found himself in the right place at the right time—which happened to be his local Polaris dealer, Mathias Marine Sports. Mathias Marine Sports asked Sam to build a custom Octane, for their entry into Victory’s ‘Operation Octane’ competition. Even better, they told him to do whatever he liked. 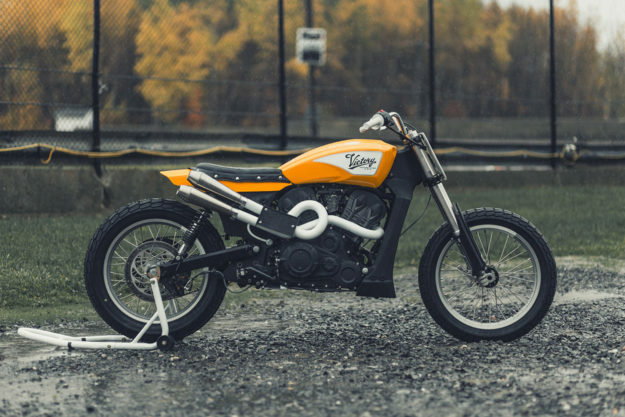 Sam is not a fan of bikes built just for the show, and didn’t want his Victory Octane to end up finishing its days on a showroom floor. He wanted it to have a purpose—on the racetrack. 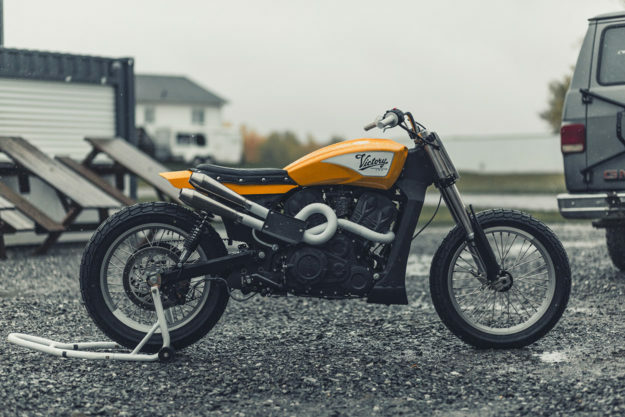 Flat track racing is one of Sam’s passions: He helped to set up the Fooligan Derby in Saint-Marcel-de-Richelieu, and headed south across the border for Portland’s Super Hooligan class and the Flat Out Friday in Milwaukee. 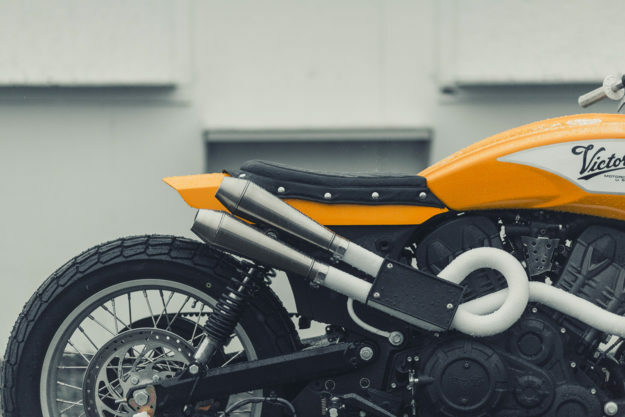 Mathias Marine Sports liked the idea of a tracker, so Sam started by cutting the rear section of the frame and fabricating a new tail unit out of steel, designed to match the lines of the tank. 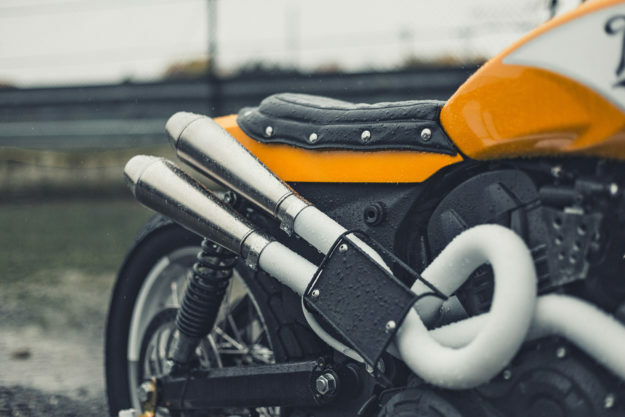 “I was happy with the final shape, but since it’s a race bike, it was too heavy.” So painter Jean-Philippe Huet made a cast of the tail section and reproduced it in fiberglass. 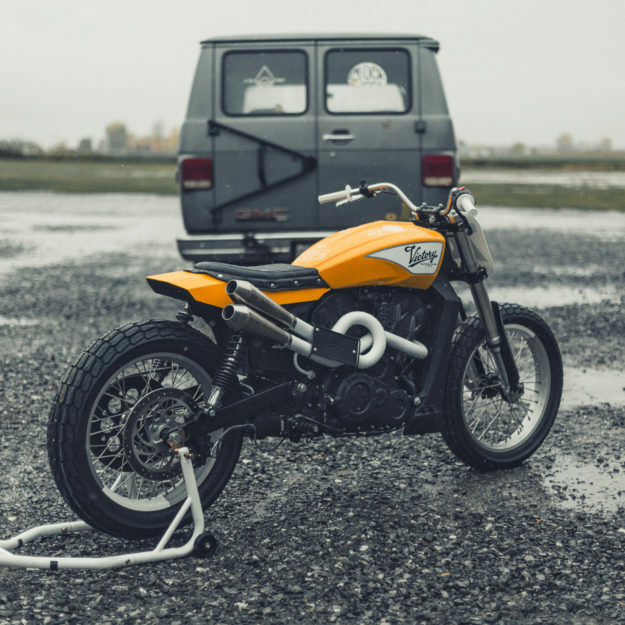 Next up was a seat inspired by the vintage Harley XR750 flat tracker, upholstered by Montréal mastermind Rod Alves. 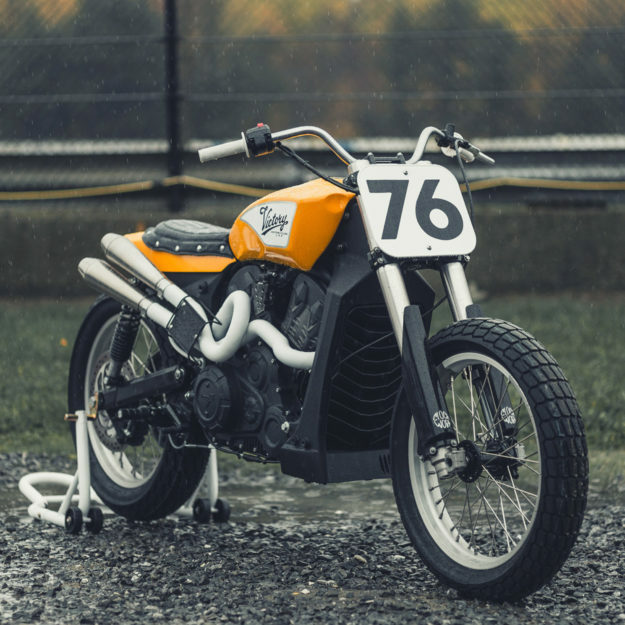 The standard Victory Octane front end is obviously not ideal for flat track racing, so Sam has installed motocross-spec inverted forks from a Kawasaki KX250, lowered about five inches and revalved. The back end now has custom-made longer shocks (which were not ready in time for the photo shoot). Sam knew he needed 19-inch front and rear wheels to fit sticky Maxxis DTR-1 rubber, so he’s chosen a set of lightweight aluminum Excel rims. The front is laced to a now-brakeless KX250 hub. The rest of the drivetrain was easier to handle. 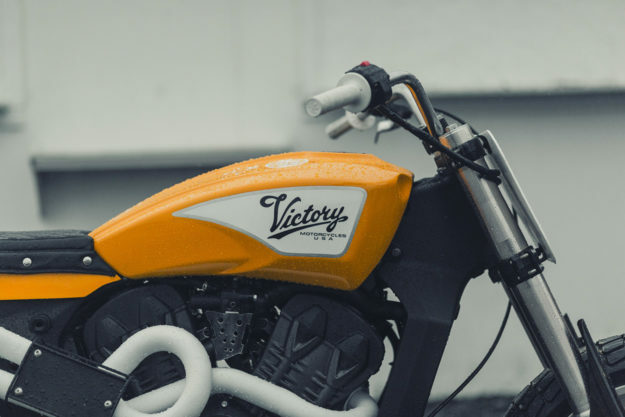 The Victory Octane is powered by an 1,179cc V-twin engine, similar to the Indian Scout powerplant, and pumping out a solid 104 horses. 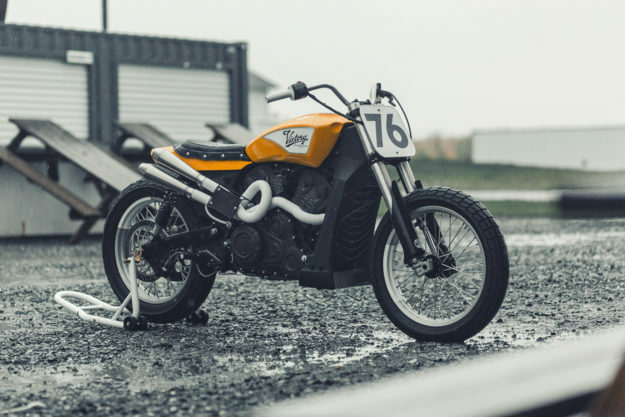 “It was already up to the task, but I wanted to give it a bit more braaap. So I got out the TIG and fabricated a new exhaust system to help it breathe better. Inspired by vintage racing, Sam decided to coat the pipes with a high temperature ceramic flat paint—as seen on the manifolds of F1 cars from the 60s. Victory supplied an upgraded intake box, and there’s also a little remapping to make sure everything works well together. All that was left was the paint. 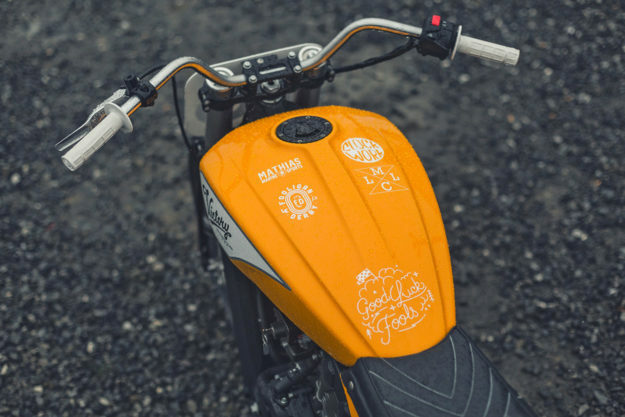 Sam put a call into graphic designer Raff Labrie of Les Loups Moto Company, and soon had some cool graphics and logos in his inbox. Then Jean-Philippe Huet laid down the signal yellow paint, taken from a vintage Porsche 911 pallete. It looks perfect. 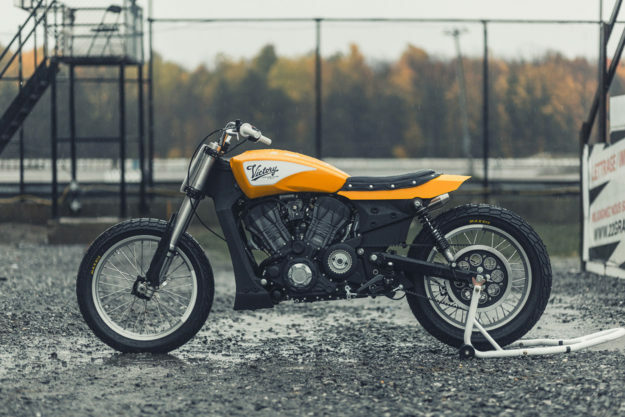 The Octane is now being tested on the track, to get it fettled in time for its race debut—which will be at the Flat Out Friday in Milwaukee, during the Mama Tried Show. If Sam is nervous at the thought of his baby hitting the deck or blowing up, he doesn’t show it. He’s planning to enter several races during summer 2017, including his local Fooligan Derby. “Can’t wait to see this beast sideways!” he says.